A legend in his own time, Ser Barristan Selmy—known far and wide as Barristan the Bold, a byname dating from when he rode as a mystery knight at the age of 10—is the Lord Commander of King Robert’s Kingsguard. He has served four kings faithfully and with great distinction, and though he was captured and almost mortally wounded at the Battle of the Trident, Robert sent his own maester to tend to him because of how honorably and loyally he had fought on the behalf of House Targaryen. Robert chose to name Barristan head of the Kingsguard, in lieu of his good-brother Jaime. 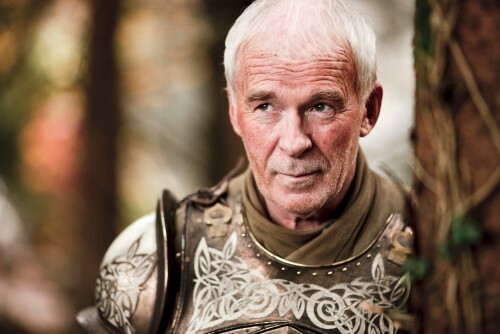 In his youth, Ser Barristan was considered the finest swordsman in the Seven Kingdoms. Though he may have lost half a step in the intervening years, he is still an exceptional warrior, able to readily beat men 30 and even 40 years his junior in the lists. His almost superhuman longevity means he is still tall and straightbacked, with white hair. He is as chivalrous as a knight can be, and would never act to dishonor himself.